This flash delivers reliable performance for professional photographers to expand their creativity in a simple and affordable way. Emitting the exact amount of light in demand, the flash helps you obtain sharp and vivid images in poorly lit environments and perfectly balanced pictures when the lighting conditions are not working to your advantage. The flash is compatible with all Canon & Nikon DSLR cameras. It supports exposure compensation, exposure bracketing, front-curtain sync, contrast-enhanced flash and automatic / manual zooming. The flash features a maximum guide number of 58 at ISO 100. It covers a focal length range of 24mm to 105mm to suit various photography needs. It can serve as a master or slave unit in the Canon & Nikon wireless S1 & S2 modes. It takes only 3 seconds for the flash to be fully charged after a full-level output. For protection in continuous flashes, to prevent the flash head from getting too hot and damage, please do not flash over 20 times when in power lever 1/2,1/1. Please cool down the flash unit for at least 10 minutes. The over-temperature protection function will be activated if you continue to flash after 20 times. In this state the charging time will turn to 10-25s. Please cool down the flash unit around 10 minutes and it will turn to normal state. Attention!!! 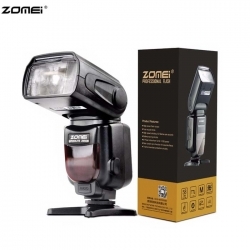 This flash is not applicable for Sony,Pentax,and Panasonic cameras!